I love buttons. I have kind of a thing for buttons. I buy these mixed bags of them at Michael's and then I sort them by color into little boxes and jars and it's just so...sick, yeah, and I love them. But what to do with them? 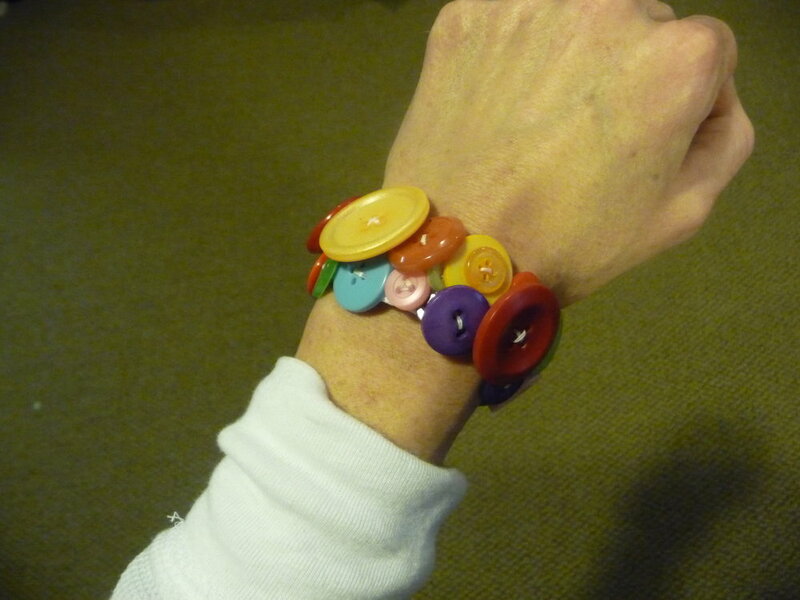 Especially around the holidays, there have to be some cool decorations or crafts to use up hoarded buttons. There are. I have three for you. 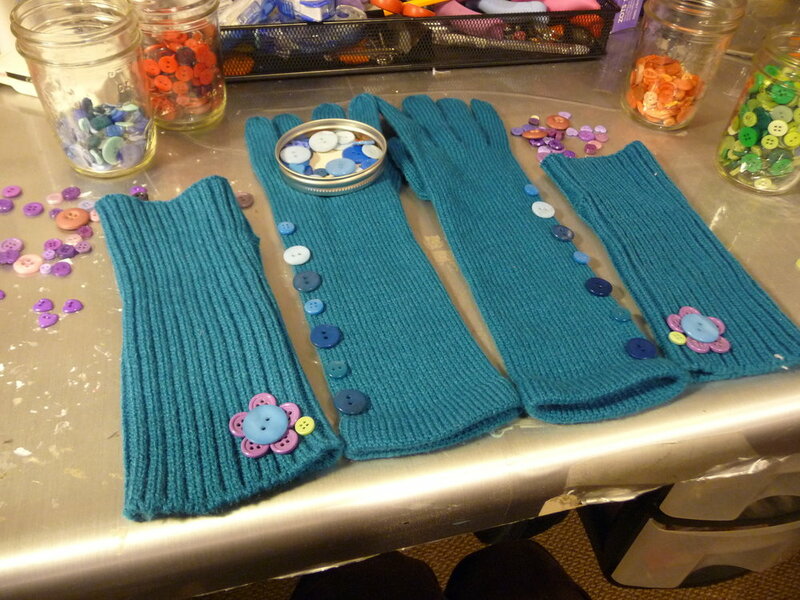 I've had this idea a while of sewing buttons onto gloves, specifically as a gift for my neeces (my neeces, of course, are the daughters of my seester-in-law). I found these at JC Penney, which came in cool colors. Now I just had to sew on the buttons. So a few pieces of advice. Actually only two. First, keep it simple, stupid. Don't do what I first did and lay out elaborate patterns of buttons. Ambitious, yes, but it would've become too overwhelming. 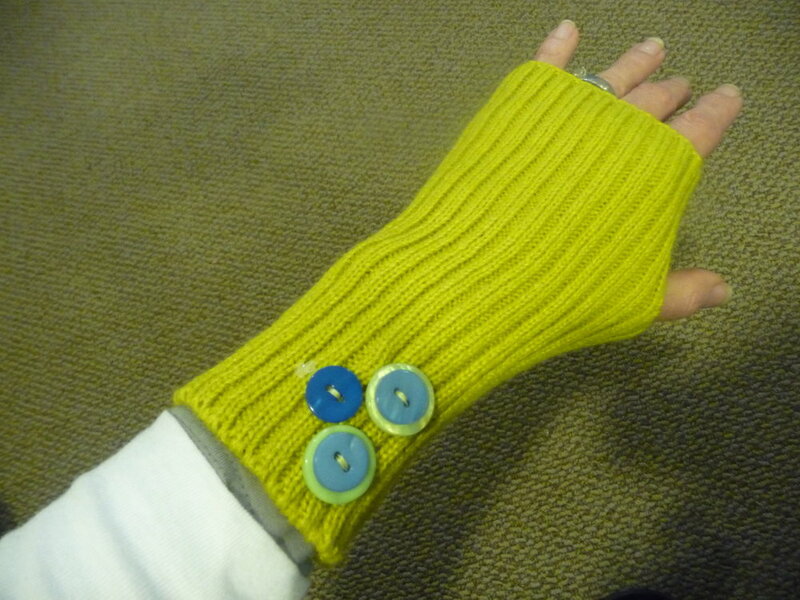 In the end I opted for just a row of buttons up one side of the glove, and a little pattern on the warmers. Second piece of advice is once you have your design laid out, dab a little Elmer's Glue under each button, avoiding the holes, and let dry. Then the buttons stay put for easier sewing, and it also makes the project transportable. I worked on these during Panda's Nutcracker rehearsals, and got the bonus validation of all the senior girls wanting to try them on. This is a fast project that you can do in front of the TV, or at ballet rehearsals, or in Starbucks, or even in bed. I've worked on them in all those places. All you need is some 3/4" elastic, needle and thread, and buttons. Cut the elastic to fit around your wrist with a little overlap. Lap the edges and sew, and then start adding your buttons. 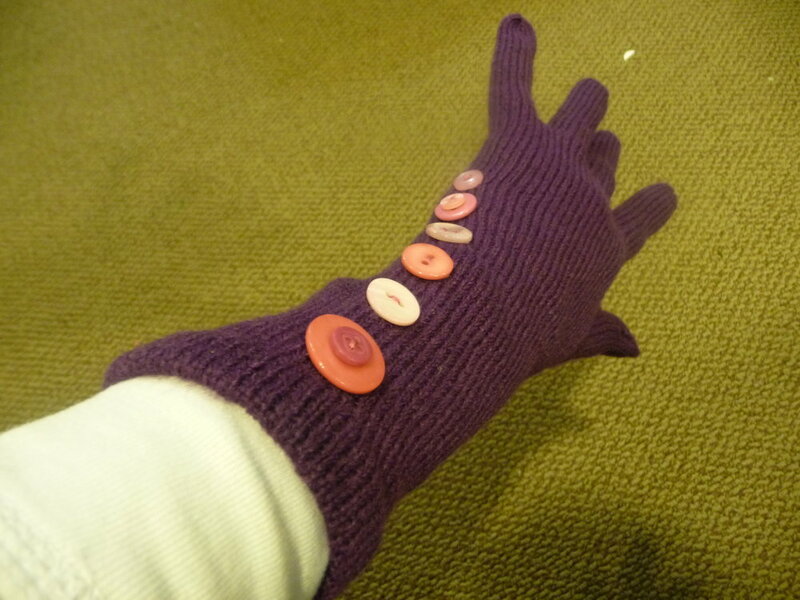 Stay towards the edges of the elastic to hide them, and fill in the spaces between large buttons with smaller ones. It's kind of impossible to mess this up however I confess that THREE times I brought up my needle on one side of the elastic, and passed it through on the opposite side, effectively tying a loop around everything that can't be undone without snipping the thread. But literally in half an hour, you have something really cute, and judging by the reaction of Panda and one of her friends, girls dig these. So go forth and push some buttons.